A few weeks ago I walked into The Juicery Co. for lunch and walked out with a bottle of E3Live’s Blue Majik. This sparkly blue powder is an extract of spirulina, a heavy-duty superfood said to relieve physical discomfort. The adult in me bought it for this reason. The child in me bought it because it’s basically blue food colouring. 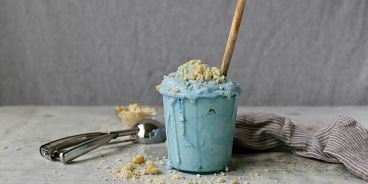 I couldn’t resist the thought of powder blue smoothies, coconut yogurt and…this ice cream, which is basically three ingredients. 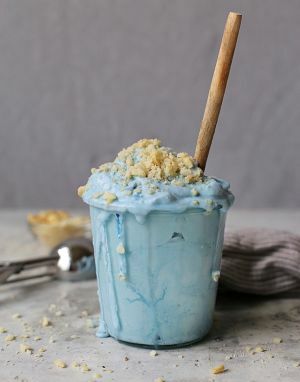 Flavour-wise, it tastes like frozen sweetened coconut milk (you can’t taste the Blue Majik). Very simple! Its colour, making it perfect for a kid party or a special occasion, is what I love most. Add coconut milk/cream to your blender along with maple syrup and coconut sugar. Mix on low speed until combined, then add in your Blue Majik. Careful not to over mix. Transfer to your ice cream maker and proceed using the machine’s instructions (I use a Cuisinart and churned for 25 minutes). Garnish with chopped macadamia nuts (and maybe a tiny pinch of salt).